Don't worry, it's for in-game currency. 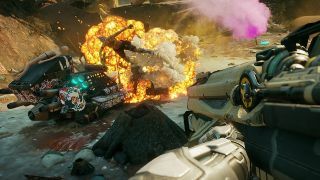 In Rage 2's ongoing mission to assure everyone it's weird, it's now promising players the chance to bend digital reality to their will with a bunch of cheats, including the classic instagib and an ejector seat that works entirely the wrong way around. The NBA Jam announcer commentary that was announced for April Fools' is also a real thing and can be unlocked with one of these cheats. New ones will appear after next month's launch, and you can check out what's been revealed below. He’s on Fire: NBA Jam announcer Tim Kitzrow will accompany you on your journey, or at least his voice, yelling encouraging things at you. Git Gud: Making things explode in one hit is great. The name of this cheat is not. Son of Thor: Surround yourself in comforting electricity, and kill enemies that get too close. Klegg Support: An NPC that you're hired to track down and kill is transformed into a friendly AI who will back you up. Phoenix Rejector Seat: The rejector seat just does the opposite of an ejector seat, sending your Phoenix hurtling up into the air and depositing you on the ground. I'm not sure what it achieves but I want to watch it happen. Everyone will get access to the same cheats, but preorder or grab the Deluxe Edition and you'll get some of them straight away. For the rest, everyone will need to hit up the Wasteland Wizard, a travelling sage with "universe-altering powers". He'll be found wandering around and will sell cheats for in-game currency. Rage 2 is due out on May 14.